Lot Detail - Historic 1905 Christy Mathewson Game Used World Series Bat Signed and Dated by John McGraw and Others PSA/DNA GU-10 and MEARS A-10. Most Important New York Giants Piece of Memorabilia Known. Historic 1905 Christy Mathewson Game Used World Series Bat Signed and Dated by John McGraw and Others PSA/DNA GU-10 and MEARS A-10. Most Important New York Giants Piece of Memorabilia Known. Baseball at the turn-of-the-century was a rough game watched from the stands by rowdy fans. Typifying the gritty characters that played the game was John McGraw, manager of the New York Giants. Taking over the team in 1902, McGraw had one man on his club that not only stood out for his talent but also for the virtue and sportsmanship that differentiated him from the usual ball player. Christy Mathewson was a handsome, college educated pitcher from Factoryville, Pennsylvania. Dubbed "Matty" by his fans, Mathewson possessed a new type of pitch that quickly made him famous - the "Fadeaway". Today it's called the slider, but at the turn-of-the-century Matty was the first hurler to master the tricky pitch. From his debut in 1900 to 1905 Matty and his Fadeaway won 128 games for McGraw's Giants including 33 in 1904 and 31 in 1905. Mathewson's dominance on the mound combined with his educated and refined personality to single-handedly change the public's image of a professional baseball player and for the first time children had a respectable ballplayer to idolize. By 1905 there was no bigger baseball star than Christy Mathewson. That summer the Giants stormed to their second consecutive pennant but had yet to appear in a World Series. The National League, founded in 1876, was considered the better quality loop compared to the American League which was only three years old. Yet when the two league met for the first World Series in 1903, it was the American League who walked off the field victorious. It was an embarrassment the older league was still smarting from when the New York Giants won the 1904 National League pennant. Giants owner John T. Brush and manager John McGraw refused to play the American League pennant winner, stating that the Giants were already World Champions since the National League was the "only real major league". Despite pleas and outrage from the press and fans, there would be no World Series in 1904. 1905 would be different. Dogged all winter by accusations of cowardice and his own players lamenting the loss of a hefty World Series check, McGraw agreed to face the American League when the team won their second consecutive pennant. Their opponent for the second fall classic would be Connie Mack's Philadelphia Athletics. This A's team would, like the Giants they would face, go down as one of the greatest teams in the game's history. Both clubs were evenly matched: Philadelphia's pitching staff boasted future Hall of Famer Rube Waddell. The eccentric southpaw turned in one of the greatest single-season pitching records in history and his 27 wins, 287 strike outs and 1.48 ERA earned him the AL's Triple Crown. However, Rube was unavailable to pitch in the post season due to an injury. Philadelphia was still in good shape with 24 game winner Eddie Plank and 18 game winner Chief Bender - both future Hall of Famers. McGraw also had two future Hall of Famers in his rotation: 21 game winner Joe "Iron Man" McGinnity and Christy Mathewson. Matty's 31 wins, 206 strike outs and stingy 1.28 ERA won him the NL's Triple Crown. Even before the Series began, McGraw started a war of words against Philadelphia, famously telling sports writers that A's owner Ben Shibe had a "white elephant on his hands". The meaning of the insult being that the A's were a team hampered by high salaries all out of portion with its earning ability. Connie Mack, always a gentleman, held his tongue but playfully presented McGraw with a stuffed white elephant before the start of Game 1. The first three games were to be played in Philadelphia. Game 1 pitted Mathewson against Eddie Plank. The A's ace yielded three runs but Mathewson was simply brilliant that afternoon, shutting out Philly on four hits. The closest the A's came to scoring was a double by Ossie Schreckengost in the sixth. A wild pitch advanced him to third but Matty bore down and finished the inning unscathed. Little did anyone know it but Schreckengost would be the only A's player Mathewson would allow to reach scoring position the entire Series. Matty even helped out the Giants offense by hitting a single in the fifth. The next day Chief Bender turned the tables on the Giants and shut out New York in Game 2 on four hits to even up the series. McGraw went with Matty for Game 3 and was rewarded with another four hit shutout. New York scored nine runs on nine hits, including a single by Mathewson. For Game 4 the series switched to the Polo Grounds where Iron Joe McGinnity shut out the A's in a 1-0 nail biter. Now with the Giants up three games to one, John McGraw turned to Mathewson again to put the final nail in the A's coffin. With two masterful shut outs under his belt, Matty faced Chief Bender. The two Hall of Famers kept the game scoreless through four innings before the Giants finally scratched a run across in the bottom of the fifth. Bender bore down and kept the Giants bats at bay until Mathewson managed to get on base with a walk in the bottom of the 8th. His catcher Roger Bresnahan smashed a double that sent Matty to third where he scored on a grounder. Now up by two runs, Mathewson got the first two A's to ground back to him and then to his shortstop for the game and world championship. Mathewson's 1905 World Series dominance has to this day been unmatched: three complete game shut outs with 18 strike outs and a single walk. Matty collected two timely hits and scored twice for a .250 average. In the midst of what must have been a sweet championship celebration, Matty grabbed his game used bat and passed it around to a few of his teammates. Red Ames, a 22 game winner that summer for the Giants, signed his name in black steel-tipped fountain pen as did fellow hurler George "Hooks" Wiltse. Second baseman Billy Gilbert dipped the pen in ink and added the date of Matty's Game 5 victory "Oct 14 - 05" after his name. Finally John McGraw inscribed his signature along with the historic date he led his boys to the first National League's first World Championship: "Oct 14 - 05. After the celebrations died down Mathewson did what he did after every season - pack up his uniform and equipment and head home to his family in Factoryville, Pennsylvania. In what had become a fall tradition, Matty distributed his game used items to family members and young fans. This signed, World Series game used bat was among the priceless personal items Matty gave away and was kept as a treasured heirloom by a Chicago area family until 2013 when it was obtained by collector Terrence R. Zastrow. It goes without saying that game used bats from the turn-of-the-century are rare as hen's teeth - to find a one attributed to a Hall of Famer of Mathewson's status, used during the most impressive World Series pitching performance in the game's history and signed and dated by John McGraw is, well, dare we say unprecedented! Not only is this the only game used Christy Mathewson bat in existence, we believe it is the earliest World Series game used bat and represents the very first World Championship in the history of professional New York sports. The bat was manufactured before the advent of model numbers, but we can date this bat by the Victorian typeface used in the center brand as the one used by J.F. Hillerich from 1897 to 1911. Like most bats used during the "Dead Ball Era", this bat weights a hefty 46oz. As can be seen in contemporary photographs of Christy Mathewson, its thick handle and small knob matches the model favored by the great pitcher during this period. Made of white ash, it measures 33" in length and is un-cracked. From the barrel to the knob, this extraordinary bat displays heavy game use. The front barrel shows checking from repeated ball contact and century-old ball marks can still be seen on its surface. Two chips are missing from the bat's knob end. In order to enhance his grip, Mathewson has prepared the bat by heavily scoring the handle 3" from the knob and 8" up towards the center brand. Also visible are traces of a single tape ring winding up and around the handle. Both these characteristics are typical of the split-handed batting style Mathewson employed at the plate. 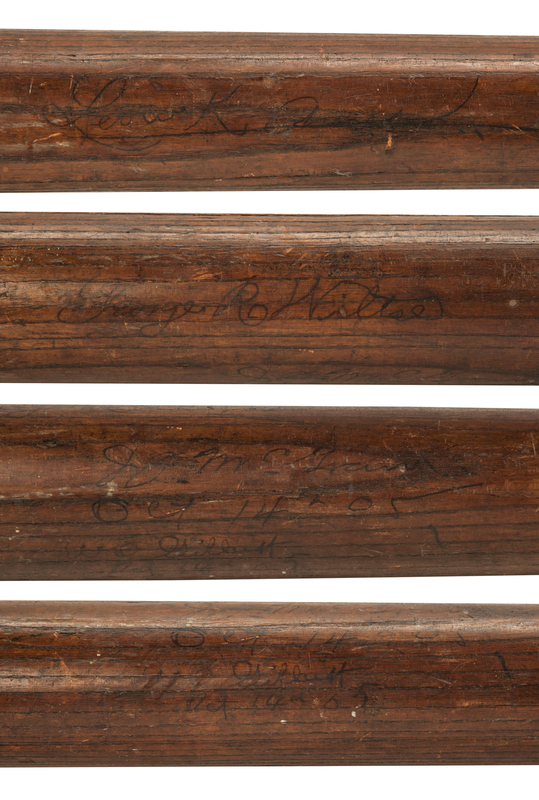 A full board of comprehensive documentation from the hobby's leading experts completes this Hall of Fame-worthy Christy Mathewson World Series game used bat. Game used experts MEARS have thoroughly examined this incredible artifact and have given it their highest grade of A10 (314257). Likewise PSA/DNA have examined the bat and awarded it their highest mark of GU10 (1B01858) and the signatures have a certificate of authenticity from JSA (X56499) and PSA/DNA (U04226). A notarized letter from collector Terrence R. Zastrow documents the provenance of this historic piece of baseball history. Due to its unique position as 1) the ONLY game used Mathewson bat in existence, 2) One of the very few game used or worn items that exists from Mathewson's career, 3) The oldest certified game used item that was used in a World Series, 4) The earliest known team signed bat (By World Series Champions! ), 5) The city of New York's first major professional championship in ANY SPORT, We feel this bat represents the single most important game used bat ever offered for public sale. This lot comes with 23 pages of research and documentation with the PSA/DNA and MEARS LOAs. Please email us at info@goldinauctions.com to have all 23 pages sent to you via email or Fedex.